Yorta Yorta painter, sculptor and activist, Lin Onus developed a distinctive visual language from a combination of traditional and contemporary Aboriginal imagery. Lin Onus was unjustly expelled from school on racist grounds at the age of 14, yet later attended university. He worked as a mechanic and spray painter, before managing his father's boomerang workshop in Melbourne. A self-taught artist, Onus forged a brilliant career and held exhibitions throughout the world. Onus's political commitment was inherent in his work. His Scottish mother was a member of the Communist Party, while his Aboriginal father, Bill, and uncle Eric were leading lights in the Aboriginal rights movement of the 1950s and 1960s. After a visit to Maningrida in 1986, Onus began his long and close association with the late Djinang artist, Djiwut 'Jack' Wunuwun and other central Arnhem Land artists, including John Bulunbulun. Onus then developed his signature style of incorporating photorealism with Indigenous imagery. It is a virtuoso effect, in which the landscape is overlaid with traditional Indigenous iconography, reflecting his strong ties with his father's community at Cummergunja Mission, on the Murray River. Onus's works from this period often have a riddling, Magritte-like quality. A memorable motif in his work is the breaking up of a seamless surface into jigsaw puzzle pieces – a metaphor for the sense of dislocation he felt, caught between black and white, urban and rural, worlds. In Onus's sculptures, irony, wit and whimsy are the predominant features. 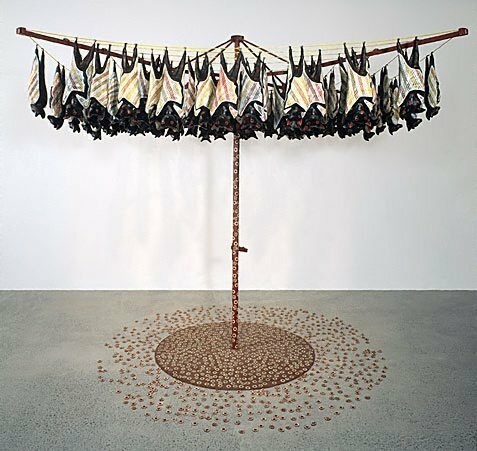 'Fruit bats', 1991, is made up of a flock of fibreglass sculptures of bats decorated with rarrk (crosshatching), hanging on a Hills Hoist clothes line. Beneath this icon of Australian suburbia are wooden discs with flower-like motifs, representing the bat droppings. In this powerful installation, the sacred and the mundane combine. The work was inspired by Murrungun-Djinang imagery, which Onus was given permission to use. In 'Fruit bats', the artist shows a head-on collision between two contrasting sets of values, and throws in a few inversions of his own. The backyard – suburban Australia's haven of privacy – becomes spooked by the formidable presence of these noisy animals. The pre-colonial bats seem to have taken over and reclaimed their place, in a story worthy of Alfred Hitchcock. a - 100 fruit bats, 41 x 14 x 8 cm, All bats vary in size, these measurements are those of an average sized bat. b - 603 polychromed wooden disks, 3 cm, diam. George Alexander, Tradition today: Indigenous art in Australia , 'Lin Onus', pg. 114, Sydney, 2004, 114 (colour illus., detail), 115 (colour illus.). Bruce James, Art Gallery of New South Wales handbook , 'Australian Collection: Aboriginal and Torres Strait Islander Art', pg. 208-241, Sydney, 1999, 231 (colour illus.). Joan Kerr, Art and Australia (Vol. 37, No. 2) , 'Millennial Icons for Australia', pg. 212-221, Sydney, Dec 1999-Feb 2000, front cover (colour illus., detail), 154, 220 (colour illus. ), 221. John Mateer, Art Monthly Australia , 'Naturalisation: recent Australian art and the natural', pg. 4-7, Canberra, Dec 2001-Feb 2002, 4 (colour illus.). Kelly McCauley, Look , 'Going batty', pg. 36-37, Sydney, Apr 2016, 36-37 (colour illus., detail). Dr Danie Mellor, Telstra National Aboriginal & Torres Strait Islander Art Award 1984-2008: celebrating 25 years , 'Lin Onus AM', pg. 189-193, Darwin, 2011, 190, 193 (colour illus.). Michael O'Ferrall, Australian Perspecta 1991 , 'Lin Onus', pg.80-81, Sydney, 1991, 80, 81 (colour illus.). Hetti Perkins, Art + soul: a journey into the world of Aboriginal art , 'Dreams + nightmares', pg. 88-153, Carlton, 2010, 90-91 (colour illus. ), 92, 280. Graham Pitts, Artforce , 'The rest is history', pg. 14-15, Strawberry Hills, Dec 1996, 15 (illus.). The Art Gallery of New South Wales - Jul-Dec 1997 Calendar , Sydney, Jul 1997-Dec 1997, (colour illus.). This image appears in detail. Artwise: visual arts 7-10 , Milton, 2004, 172 (colour illus. ), 173. The Art Gallery of New South Wales - 1996 exhibitions , Sydney, 1996, (colour illus.). This image appears in detail. AGNSW Collections , 'From Colonialism to late Modernism', pg. 7-106, Sydney, 1994, 106 (colour illus.). Yiribana , Sydney, 1994, 18 (colour illus.). The Art Gallery of New South Wales - Jan-Jun 1997 Calendar , Sydney, Jan 1997-Jun 1997, (colour illus.). This image appears in detail. Introduction to Aboriginal and Torres Strait Islander art , Port Melbourne, 2003, 13 (colour illus.). Australia's best: artists & designers , 'Lin Onus', pg. 14-15, Melbourne, 2004, 14, 15 (colour illus.). Cambridge visual arts: stage 4 , Cambridge, 2008, 162 (colour illus.). Art Gallery of New South Wales: highlights from the collection , Sydney, 2008, 38-39 (colour illus, detail), 40 (colour illus. ).